Located in the Chagos Islands, Diego Garcia is one of the most pristine areas of the world. When the British allowed the United States to use the base in the early 1980s, the authorization came with clear environmental controls to prevent the deterioration of the natural surroundings. Four years ago, the British Indian Ocean Territory (BIOT) were declared the world’s largest marine reserve. 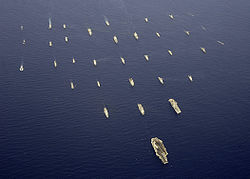 However, its greatest danger appears to be the United States Navy. For decades, in direct violation of governing standards, the U.S. Navy has dumped hundreds of tons of human waste into the lagoon. In the meantime, while 5000 U.S. service personnel are dumping waste into the waters and coral reefs, Chagossians are being kept from returning to their home because of the delicate environmental conditions of the area. The U.S. dumping has resulted in elevated levels of nutrients with nitrogen and phosphate readings up to four times higher than normal. The coral – may be damaging the coral. The dismal record of the U.S. was revealed in a recent statement from the Foreign and Commonwealth Office. U.S. vessels have been uniformly dumping their date into the lagoon since the early 1980s. The practice violates express British policy and the Ramsar Convention on wetlands. Putting aside the double standard applied to the original natives who have been kept away from their homes to “protect the area,” it should not take a formal agreement to get the U.S. Navy to observe a basic protection of a pristine area. Every captain who ordered the release of the wastes into the lagoon knew that he or she was destroying the area. What is particularly maddening is that the Navy arranges for waste removal in other areas and such capabilities are available. It simply chose to pollute this area because it could get away with it. The Navy often insists that it has trained its commanders to adhere to environmental values but this is an obvious and straightforward test of those values and we failed miserably. 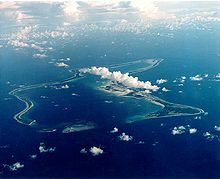 The Navy record at Diego Garcia is a disgrace and only adds to the view of the country as hypocritical on legal and environmental standards. It is truly amazing when one looks at Diego Garcia through Google Earth that it actually exist anymore. How long has the Islands been there ? One would think with global sea level rise, rising at unprecedented rates, the Islands would be completely covered by now and would have vanished like 777. Oh wait maybe Obama diverted it there. FYI: It isn’t ships in the harbor that are causing the pollution problems so much as it is the fact that US Naval Support Facility Diego Garcia (et al) has no sewage treatment plant to clean the raw sewage effluent, created by defecating/urinating service personnel, before it is discharged directly into the harbor untreated. Putting aside the double standard applied to the original natives who have been kept away from their homes to “protect the area,” it should not take a formal agreement to get the U.S. Navy to observe a basic protection of a pristine area. That isn’t true the Chagossians were removed by the British government with the express foreknowledge that the US government was going to build a military base upon the atoll and had nothing whatsoever to do with “protect the area” as the area was not pristine as over 2000 Chagossians had been living there for over a thousand years with various European powers setting up shop over the centuries building plantations, piers, houses etc hardly a pristine area. There aren’t just US service personnel at Diego the British and our other allies are as much to blame. Although I would take the raw sewage any day over the open air burn pits that are still used at a great many overseas US military facilities. Does the President have any knowledge of this situation – by the way, whose job is it to get his opinion ? Seems like we use to have a press that looked into such things ? Well… We leave the crap everywhere we go it seems…..
What was the name of the rock and roll singer that accidentally dumped the reserve on a bridge… Pelting the folks below…. While closer to home, the army corps of engineers proposes to do open water dumping of toxic sledge from the cuyahoga river harbor, within 2 miles of a water intake crib(valve) that provides drinking water . The Ohio EPA has shofar bee opposed to this proposal. The corps maintains this is the most economical solution,although this will be this time in 40 years that open water dumping will be done. The corps is still stonewalling on endorsing anAsian carp solution. Well maybe it is a good thing that rising seas may swamp the atoll – this is another case of the US sh**ing on the planet (literally) – what are they thinking – While at the same time trying to tell the world they are the greatest nation on earth ! This is a world-wide habit of a civilization that seems alien to the Earth. What sane civilization would destroy that which is mandatory for its own survival? My heart is so very sad. And to think one executive order should (one would expect) put an end to this. The fact the Chagossians were run off for environmental reasons is BS. They were inconvenient to the military presence as everyone knows. this is unacceptable all around. If anyone is interested in what the place looks like, these are the coordinates. Copy and paste into Google Earth. The coordinates take you to the huge airport on the western side of the atoll. This is a major B-52 base, and if you zoom in closer on the ramp, you will see it is full of parked B-52 bombers. You have to scroll out a bit to see the whole atoll. What Justice Holmes said! There is no excuse for wanton disregard for environmental safeguards. Every captain who dumped waste into this area should be court marshalled. Any higher civilian official who knew of this conduct and did nothing should be fired!